This soup has so many layers: the creamy coconut milk soothes the complex curry paste, the brininess from the fish sauce gives it all the salt you need, while the pineapple and lychee make it slightly sweet and sour. From poultry to meat or seafood, this soup base is very versatile, plus gluten free, low carb, paleo. With the option to make it vegetarian by swapping out vegetable stock for the chicken, it can please anyone - so I like to make it ahead and store in my refrigerator for quick, flavorful meals. On a busy weeknight, I serve it poured over a hot bowl of steamed rice finished with a mess of fresh herbs on top. 4 cups Chicken Stock (you can substitute store bought low-sodium broth) or 4 cups Vegetable Stock if you want it vegetarian. In a 4-quart hot pot or large saucepan, heat the oil over medium-high (about 425 degrees for an electric hot pot). Add the curry paste and cook, stirring, until fragrant, about 2 minutes. Stir in the the coconut milk, stock, lychee, pineapple, fish sauce, sugar and lime leaves and bring to a boil. Cover, reduce the heat to low and simmer until very flavorful, about 20 minutes. MAKE AHEAD The broth can be refrigerated for up to 3 days. Reheat gently on the stove top. The most difficult thing about this recipe was coming up with a name for it. My Thai friend Katie was explaining to me that you cannot call a curry a hot pot in Thailand because they are two separate things. 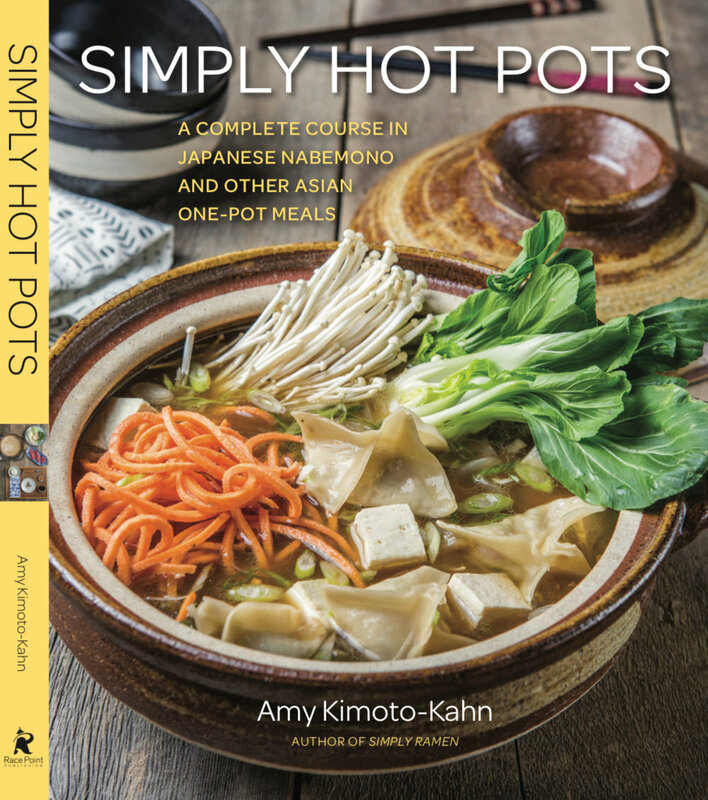 Thai curries are traditionally thicker in consistency, while Thai hot pots are more similar to traditional dashi-based Japanese recipes. I think the creaminess of the coconut milk and the robust profile of curry lend themselves well to hot pots - the meat and vegetables soak up so much of that flavor in a brief time. Here, I use a base that has all of the complexity of a creamy Thai curry, but it is thinned out with a bit of chicken broth so it’s thin enough to swish your vegetables around in. Season the chicken with salt and pepper. In a large skillet, heat 1 tablespoon of the oil over medium-high heat. Add half of the chicken and cook, stirring once or twice, until browned, but not cooked through, 4 to 5 minutes. Transfer to a clean bowl and repeat with the remaining 1 tablespoon of oil and chicken. Heat a 4-quart hot pot or large saucepan over medium-high (about 425 degrees for an electric hot pot). Add the broth and chicken and bring to a boil. Reduce the heat to medium-low and simmer for 5 minutes. Add the eggplant, kabocha, cabbage and tomatoes and continue to simmer until the vegetables are tender and the chicken is cooked through, about 5 minutes more. Stir in the basil leaves and chilies, if you would like a spicy soup. Ladle into shallow bowls and serve with steamed rice. What can I say, I’m a little biased but I have tasted a few apple pies in my day and I think my mom’s is hand’s down the best. I remember growing up seeing her test out different types of crust with butter vs. lard, making sure not to over mix the batter, adding an ice cube to the batter to keep it cold, rolling out the dough in a frenzy before it got warm. It has taken over 40 years to perfect (a small hint to my age) but I think it’s at its best right about now. Prepare apples before making the crust by mixing apples with ingredients in a large bowl. Set aside. Sift together 1 1/4 cup flour, salt and sugar in a medium-sized bowl. Cut in 3/4 butter. Leave in large pea-sized chunks. In a separate small bowl, mix 3 tablespoons ice-water with 1/4 cup flour to make a paste (this is the secret to the crust). Combine the ice-water mixture with the cut-in butter mixture to form a ball in the medium-sized bowl. Mix with a fork, do not use your hands. Mix as little as possible. Add a sprinkle of ice-water if the dough is not binding. Divide the ball into 2 parts for upper and lower crust and wrap in saran wrap. Place in refrigerator for 30 minutes minimum to chill. On a well floured board, roll one of the crusts out into a long oval and fold over into thirds to make the crust flaky. Repeat. Work quickly and handle as little as possible. Keep the other crust in the refrigerator until ready to use. Roll out in a large circle for the bottom crust to fit your pie pan with enough to go over the edges by 1/2 inch. Place in a large pie pan. Sprinkle the bottom crust with flour. Do not prick the crust. Heap in the apples and press down lightly to compact the apples. Add butter slices on top evenly. Roll out the top crust the same as the bottom crust by rolling out into a long oval and folding over to make the crust flaky. Repeat. Work quickly and handle as little as possible. Roll out into a large circle. Cut in vents. Roll the top onto the rolling pin to place on top of the apples. Trim around the raggedy edges with a scissors so dough hangs over 1/2 inch from rim of pie plate. Roll the edges under to seal the crusts together and flute the edges. Brush top of crust with egg wash and sprinkle lightly with sugar. Place in 450 degrees oven for 10 minutes, then reduce the oven temperature to 350 degrees for 50 minutes. This recipe actually started as my attempt at making traditional Chicken Karaage, which is like Japanese fried chicken. But, it turned into a real test kitchen experiment with different types of flours and trying to find the best batter and method to making crispy chicken that stayed crispy. I used Katakuriko (Japanese potato starch), Mochiko (Japanese rice flour), regular AP flour and after days of trial and error, I concluded that Chicken Karaage really needs to be double-fried to stay crispy which I just don’t think the average person wants to do - nor do I as a mom of 3 kids. So, this is my cheater version that is equally crispy and flavorful, but doesn’t require double frying. This chicken is marinated much like karaage so the chicken stays moist, tender and flavorful, but I dip it in egg and panko (Japanese breadcrumbs) and then deep fry it. It comes out crispy and stays that way - for hours. Need to crisp it up? You can pop it under the broiler or toaster oven for a bit. Can’t find katakuriko? No worries, we’re using panko which is widely available. Plus, my kids loved this and gobbled them right up and said “Mom, this chicken is delicious!”, thus the name. Done. I need a nap. In a medium bowl, whisk the shoyu, agave, sake, grated ginger, garlic, spring onion, salt and pepper together until smooth. Cut each chicken thigh into 4 uniform pieces and add to the marinade. Let marinate for at least 1 hour and up to 4 hours in the refrigerator. Set a cooling rack in a foil-lined rimmed baking sheet. In a small bowl, whisk the kewpie with the sriracha. In a deep, straight-sided medium skillet, heat 2 inches of oil to 325 degrees. When the oil is hot, test the temperature by adding a small amount of batter to the hot oil. It should sizzle and fry up quickly. In one shallow bowl, beat the eggs. In a second shallow bowl, spread the panko in an even layer. Working with one piece of chicken at a time, tap off any excess marinade, then dip them into the egg and then cover them with panko. Working in batches and being careful not to crowd the skillet, add the chicken to the oil and fry until golden brown on both sides, about 3 to 4 minutes. Transfer the chicken to the prepared cooling rack, making sure none are touching and repeat with the remaining chicken. Serve warm or at room temperature and garnish with lemon wedges. The chicken will remain crispy for hours. Note: This recipe takes a while to make because of the slow cooking of the beef but if you decide to use the Japanese Curry Broth as a base for a more traditional hot pot - with thin slices of meat and vegetables that you dip in the broth and quickly cook, you can reduce the time. Japanese curry is strong in flavor but has a subtle sweetness and isn’t terribly spicy, so kids tend to like it over stronger Indian or Thai curries. The low and slow method of cooking the stew meat will break down the meat and leave it juicy and tender - so don’t bother getting higher grade cuts of meat for this as it will do the reverse and result in a tough meat when cooked for longer. You can add other vegetables like, bean sprouts, napa cabbage and shiitake mushrooms to this hot pot but to please my kids, I’ve left only what they like in this one. Make the roux. In a medium-sized saucepan over medium heat, melt butter. Add the flour. Stir constantly with a wooden spoon for 6-7 minutes. The roux will rise slightly and be a pale brown color with a nutty smell. Add the curry powder, garam masala, ground coffee and white pepper and continue to cook over medium heat until fragrant, about 2 minutes. Set aside. Make the broth. Heat a 4-quart hot pot or large saucepan over medium-high heat (about 425 degrees for an electric hot pot). Heat the oil and add the garlic and ginger and cook over medium-high heat until fragrant, about 2 minutes. Add the onion, reduce the heat to medium and stir constantly for about 20 minutes or until onion starts to caramelize. If brown bits start to form on the bottom of the pan from the onion, just scrape them up with a wooden spoon and let them incorporate into the onions. Stir in the tomato paste, shoyu, brown sugar, roux and chicken broth and bring to a boil. Cover, reduce the heat to low and simmer until all the flavors are combined, about 20 minutes. Season the cubed meat with salt. Lightly coat the meat with flour. Heat the olive oil. Add the meat and saute until browned. Cook in batches if necessary so that the meat does not touch. Ladle the 5 cups of prepared Japanese curry broth into the hot pot until the meat is covered. Bring to a boil. Add the carrots and the potatoes. Cover and cook for an additional 45 minutes. Add tofu. Cover and cook for an additional 15 minutes. Serve healthy portions over a bowl of hot steamed rice.